There are a wide range of geomembrane liners on the market today, and choosing the right one can be challenging. Should I use a geotextile cushion to protect the liner? How is this material installed? Can a panel be fabricated large enough to fit the area? Should I use a reinforced or textured liner? Is the liner going to be covered or exposed? Please call us at 609-971-8810. We welcome the opportunity to answer your questions and help you select a geomembrane liner material that is both cost-effective and fit for the application at hand. Geomembrane liners are used to cover anything from simple stockpiles and athletic fields, to more complex applications such as a daily landfill cover. They prevent water infiltration, erosion and in some cases preserve air space in a landfill. Materials range from lightweight 8 mil with extended UV protection to heavy duty reinforced 60 mil. In addition, lighter colors are available for summer months. Consider using an extended UV sandbag and rope ballast system to protect your cover from wind uplift or ask us about our no rope pocketed sandbag cover. Landfills require the strongest barrier of protection to prevent leachate and its toxic elements from entering underlying aquifers, nearby rivers and the environment. Geomembranes play an important role in modern landfill design. A variety of liners can be utilized to meet both the containment and environmental needs of the oil and gas industry. Products range from 6-100 mil in thickness. They are available in large roll goods or custom fit to your containment area to minimize the cost of installation. 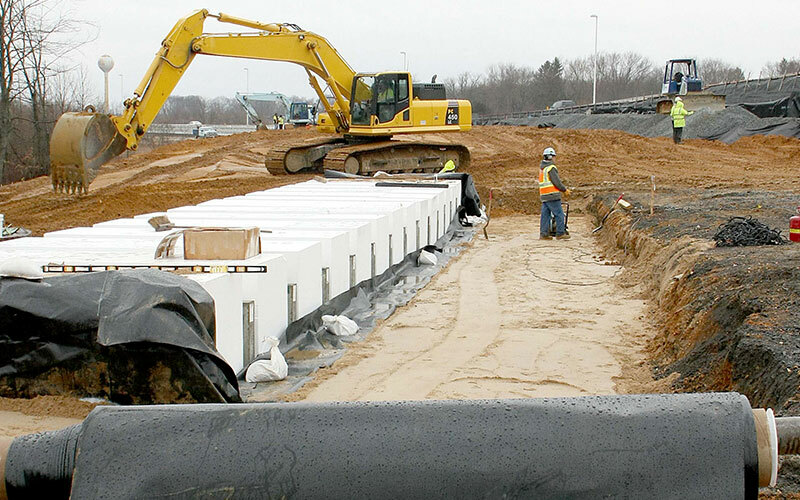 It is important to select a liner that is chemically compatible with your site, durable and weather-resistant. Geomembranes are used in modern mining operations to prevent leakage and corrosion. Solution ponds and heap leach pads used in the mining process require the most durable containment lining systems available. A wastewater lagoon liner is a geomembrane that lines a shallow pool or pond used to contain liquids, control sewage and waste seepage contamination. Both agricultural and industrial applications require the use of a durable and chemical resistant liner that can withstand a harsh environment. Floating covers control odors and methane gases given off by waste. When selecting a material, consider durability, puncture and tear resistance as well as UV and chemical resistance. Covers can also be custom fabricated to meet both specifications and project site conditions. Geomembrane liners provide containment in a variety of commercial and recreational settings. Their use includes lining golf course ponds and water features along with stormwater retention ponds and irrigation canals. Some liners release plasticizers and harmful byproducts into the water which can hurt the delicate fish and plant life. Applications such as lakes, ponds, reservoirs, dams and potable water storage require NSF certified geomembranes. IWT Cargo-Guard recently worked with Ferreira Construction/ Crisdel Group Inc Joint Venture on the New Jersey Turnpike Interchange 6 to 9 Widening Program for Contract 6. 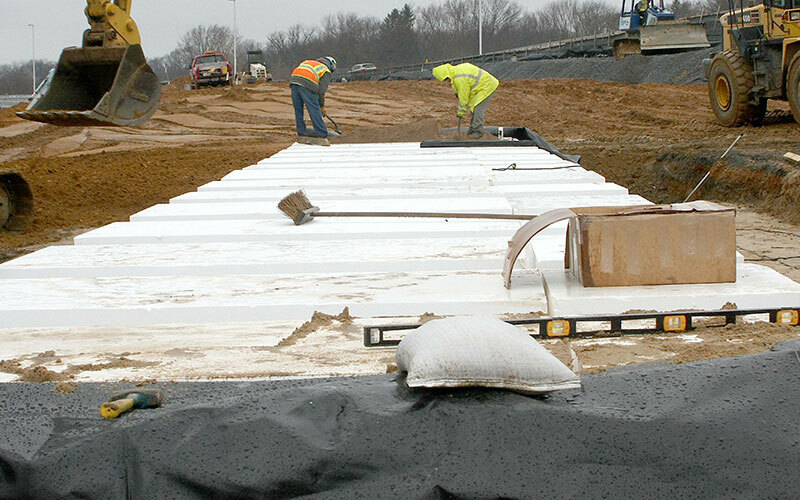 A section of the project required a gas resistant geomembrane liner to wrap EPS Geofoam blocks which were being used as an alternative for soil backfill. With installation assistance from East Coast Liner, they successfully installed a new gas resistant geomembrane liner developed by Raven Industries called Absolute Barrier™ EB25BS. The Absolute Barrier™ EB25BS is a seven layer co-extruded geomembrane consisting of a very flexible, linear low-density polyethylene (LLDPE) and an inner core of chemically resistant barrier resin. It is designed specifically as a barrier against radon, methane and VOCs. Absolute Barrier™ performs extremely well against gasoline vapor transmission in geofoam protection applications. In addition to being the best performing liner for this project, it was also the most cost-effective solution for our client. IWT Cargo-Guard has represented Raven Industries since 1991.